Lately i've been experimenting a lot with the hidden "dump" option of "debug ip packet", trying to decode various protocols. Yesterday i wrote a post about decoding the tacacs communication, something that required a little bit of awkward text editing. Tonight i created the following perl program in order to make the whole process easier. You just give it the cisco dump as input (only lines starting with an 8-char hex number are processed, so you don't have to worry about other lines) and it produces a text file that can be fed into text2pcap. Then you give text2pcap the new text file as input and it produces a pcap file as output, which can be opened with Wireshark. i.e. we want to convert the following log produced by "debug ip packet dump" to a text file compatible with the "text2pcap" program. 082D1810: A8B3C2B9 3EC12A1F AA40DE66 D7429C89  (3B9>A*.*@^fWB.. First we save it in a ascii/text file (i.e. "test.dump") and we give it as input to the "ciscodump2text" program. Then, we convert this new text file into a pcap file by using the "text2pcap" program, which is included with Wireshark. 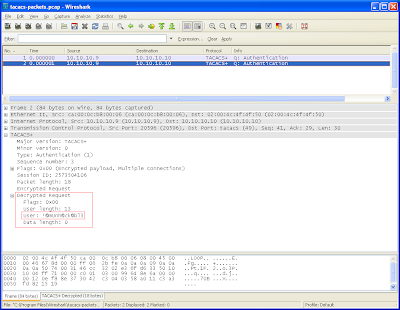 The resulting pcap file "test.pcap" can be opened for further processing with Wireshark. 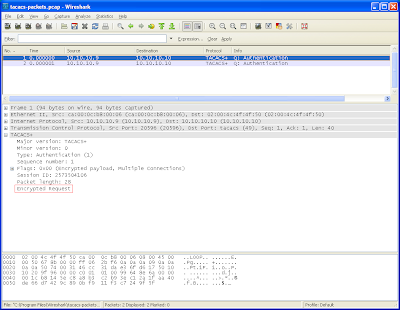 That way you can very easily create pcap files of almost everything happening on your router. Notes : The "dump" option is supported since 12.0 IOS. Latest IOS includes EPC, which makes the whole capture & convert-to-pcap process much easier. PS : I'm not a very good perl programmer (although i have written a lot of custom perl scripts for my job), so someone playing with perl for years will probably produce a more compact "perlish" code. I just tried to interpret my logic into perl code. In a previous post of mine i had described how easy it is to find the login credentials of any user, as long as you have enable access on the router where the user is trying to login and the user is using telnet. You all know that ssh is a better, far more secure, access method since the whole communication is encrypted. You also know that usually an external aaa server is used in order to allow privileged access in routers. As an aaa server you can use a tacacs+ or a radius server, with tacacs+ being the preferred choice because it also provides authorization as a different operation and encryption of the full payload. What would you say if you could capture the aaa server's traffic from inside the router itself, decode it using the tacacs/radius key stored in the router's configuration and find the credentials of everyone logging into the router, regardless of the user's access method? You don't even need any sniffing (on the wire) to take place. Let's suppose we have a router which is using tacacs+ for its login authentication and we're trying to find the login credentials of someone logging into it using ssh (the access method is irrelevant!). 10.10.10.10 is the tacacs+ server you're trying to monitor and tacacs (tcp/49) is the port the server is listening to. If you don't want to look for it into the config (with "sh run"), the following will give you the details. Then you enable the hidden "dump" option of the "debug ip packet" command and you wait for someone to login. Keep in mind that if you use tacacs for many kinds of authentication/authorization/accounting you'll get a lot of output, so try to capture as much as possible (generally try to have a large buffer). So you got 4 packets with tacacs authentication data, with the first 2 being the same and the last 2 being again the same. Now do a "sh log", trying to locate the packets with the above found hex offsets (hex offset is the very first hex number at the left of each line). 08001270: 46CC31DA E36FD617 50101020 F4BA0000  FL1ZcoV.P.. t:..
082D1110: 46CC3202 E36FD633 50101004 FF710000  FL2.coV3P....q..
08001C70: 46CC3220 E36FD646 50100FF2 F4730000  FL2 coVFP..rts..
082D25B0: 46CC3220 E36FD646 50190FF2 F46A0000  FL2 coVFP..rtj..
Their difference is that Packet 1 and Packet 3 do not contain the L2 header. The debug output shows these packets as "sending" vs "sending full packet" which are the full packets. Since it's better to have the full packet, erase the sub-packets (packets that do not contain the L2 header = packets with the least data). Now, you have to convert the above 2 packets into a format that Wireshark can understand. 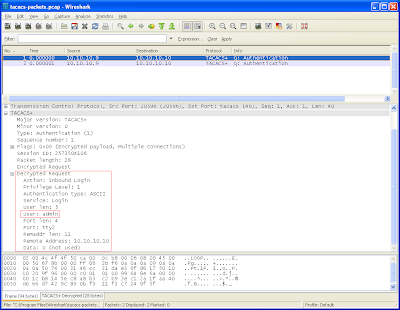 There is an extra program you'll find in your Wireshark folder, called "text2pcap" that can help you in that. But it requires a specific input format. 082D1810: A8 B3 C2 B9 3E C1 2A 1F AA 40 DE 66 D7 42 9C 89  (3B9>A*.*@^fWB.. 082D1110: 46 CC 32 02 E3 6F D6 33 50 10 10 04 FF 71 00 00  FL2.coV3P....q..
Then remove the ":" from the hex offset and recalculate each packet's offsets starting from 00000000. Every row is 10 (hex) bytes, so it gets easier after you find the offset for the 2nd row. 00000046 A8 B3 C2 B9 3E C1 2A 1F AA 40 DE 66 D7 42 9C 89  (3B9>A*.*@^fWB.. 00000026 46 CC 32 02 E3 6F D6 33 50 10 10 04 FF 71 00 00  FL2.coV3P....q..
You need the encryption key used by the tacacs in order to decrypt the tacacs part. If the tacacs key is encrypted in the configuration (like the above), then you can decrypt it by configuring it under a dummy key-chain (something that most of you should know already). key 1 -- text "T@c@csS3cr3tK3y"
Open Edit->Preferences in Wireshark and move to Protocol->Tacacs. Fill in the tacacs key you found and voila! Next to the "User:" field you'll find what you're looking for. The sequence numbers will help you identify which one is the username and which one is the password (normally the username comes first). Notes : You can use the above procedure in order to convert any Cisco "debug ip packet dump" output into the pcap format. Update 19-Apr-2009 : If you don't want to mess with manual text editing, i have created a perl script which converts the dump output into a text2pcap compatible format. What is a PER (Product Enhancement Request)? According to your votes in the recent poll, i ended up having some interesting results. While some other companies have PER open for public with online forms, Cisco likes to keep it internal. Even worse, you cannot watch its progress, unless you manage to persuade TAC to open a bug (as enhancement) and then tell your account team to attach a PER to this bug. Your Cisco account team has access to the Product Enhancement Request (PER) tool. With this tool, the Cisco account team can submit a PER on your behalf, always with a "good" business case behind it. Generally, Product Enhancement Requests are things that you'd like to have on your devices, but are not happening, because there isn't any need for them (due to various reasons). According to Cisco procedures, your Sales/Account Team needs to open and follow up on the PER request. It then goes to the Business Unit (BU) and gets reviewed and if approved it is prioritized to be implemented. Judging from my experience and your votes to the poll, you'd better have a very good business case if you want to see you request being implemented. i.e. if you work for NTT, DT, BT, AT&T, then this is by default a very good business case. Otherwise you'll have to try very hard to convince the BU to accept your request. Also, if you have (or intend to buy) hundreds or thousands of cisco boxes, then this is also a very good business case. If you don't belong to one of the above categories, then the BU might say that your request is a corner case; don't believe them. They usually mean that your business is a corner business. To be honest, i have to somehow agree with the above concept. Companies that bring a lot of money to Cisco, should have their requests prioritized. After all, they are the most important customers. 1) Redistribution of FHRP (First Hop Redundancy Protocol) IPs into routing protocols does not take into account the state of active/standby interfaces. That means you cannot (easily) influence the downstream direction of packets. 2) Although there have been at least 3 years since ethernet has replaced ATM in the broadband edge, Cisco's MIBs do not support counting of PPPoE sessions per ethernet subinterface. 3) There aren't any cvpdnTunnelBytes* 64bit counters (used in VPDN tunnels). When gigabit and tengigabit interfaces are becoming common in all broadband platforms, some counters insist on 32bit. 4) The PPP idle timer feature ("ip idle-group") which is supposed to be an enhancement made specifically for LAC/LNS scenarios, was working fine in 12.3x, but got removed in the broadband 12.2SB release (on 7200 & c10k platforms). Even the new broadband platform (ASR1000) doesn't have it. 5) There is a hardcoded limit (for no apparent reason) of 8 UNI ports that can use community vlans on the ME-3400G-12CS. If you need more, you have to turn them into NNI. 6) If you're using an aaa server for system accounting, then in case of a problem on your aaa server, you'll have to wait for 2-3 mins to login into your routers, regardless of the aaa method used for your login. 7) "Configuration Change Notification and Logging" keeps a record of all per-user configurations applied through radius (i.e. ACLs) under a subscriber vtemplate. All of the above cases got pwned by Cisco with the excuse "a PER must be submitted in order to be implemented". Of course, on some of them this is true, because they are new things and a lot of work needs to be done. Some others seem more like a misbehavior that needs to be fixed. According to Cisco, everything that adheres to the documentation cannot be considered a bug. So, keep that in mind. I understand that my current needs are different from many others, but the possibility of someone else having the same needs can't always be zero. I would like very much to see all submitted PERs in a poll by Cisco, so other customers could choose what they would like too. I'm sure that there are many good and simple ideas submitted as PERs that can be useful to everyone, but they are hidden somewhere away from the public. PS: Since i don't have any actual internal info, a lot of my talk about the PER process might not be accurate. Please feel free to correct me.